Join Campus Ministry on Thursday, February 24 at 9 pm in the Bronx Beer Hall for a fun and lively discussion led by Sr. Judith Kubicki and Sr. Mary Catherine Redmond. These two sisters will tell their stories of vocation, faith and love in action, which has led them to lead lives of service! All members of the Fordham community, 21+ are invited to join! Part of the Solution (POTS), currently has a need for an volunteer/intern who can help them screen clients in the waiting room to make sure they have the necessary documents. This role would be an enormous help not just for their team, but for their clients themselves–some clients will wait three hours to see a case manager, only to find out they are missing documents and to be sent away to do it all over again. 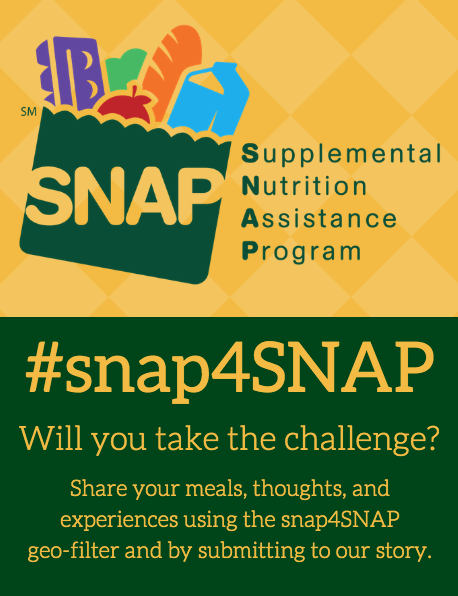 A student in this role would have the chance to gain valuable experience doing social service work at a nonprofit, to learn the ins and outs of SNAP (food stamp program), to do direct service with clients, and to give back to the local community in a lower-time-commitment context than other internships. The case management hours are 9 am-3 pm, Monday–Wednesday and Friday–Saturday. The morning (between 9 am-12 pm) is when they are in most need of a screening intern. POTS is location on Webster Ave, just outside the Rose Hill campus. Anyone interested has questions can email Catherine Larrabee at catherine.larrabee@gmail.com. Thank you! 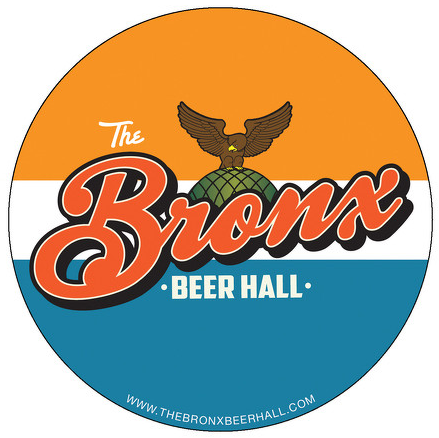 Happening at both Rose Hill and Lincoln Center. 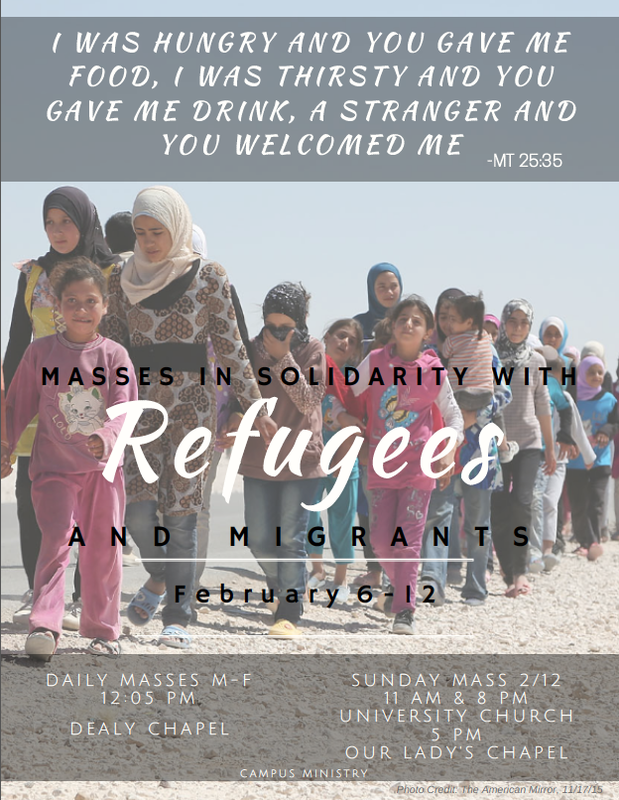 As refugees and migrants around the world continue to navigate the uncertain landscape of the United States travel ban, we will be offering up our prayers for them at Daily and Sunday Masses between February 6th and 12th. 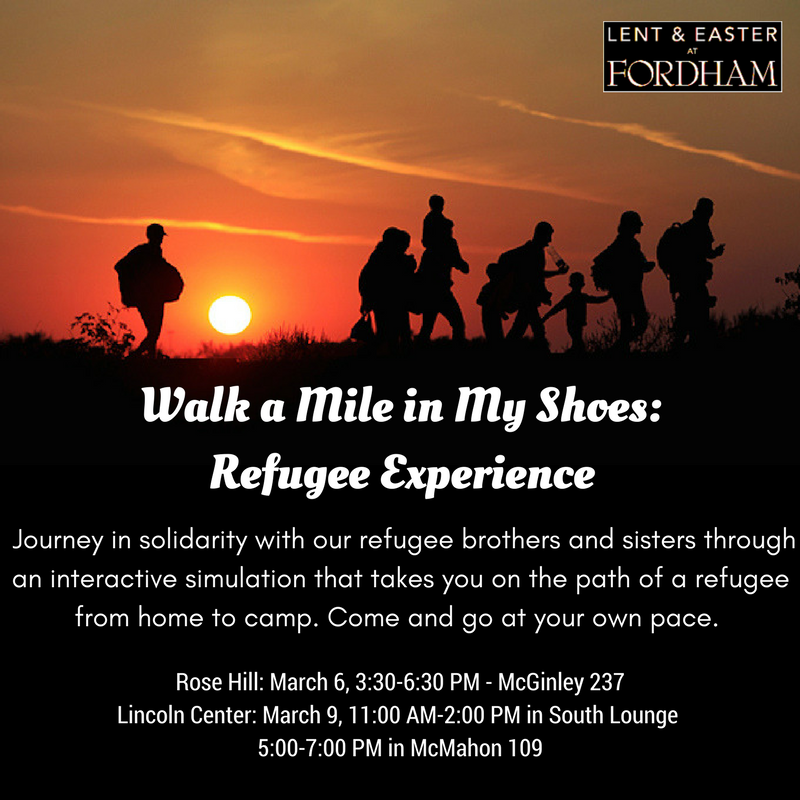 Please join us at both the Rose Hill and Lincoln Center campuses to pray and reflect. 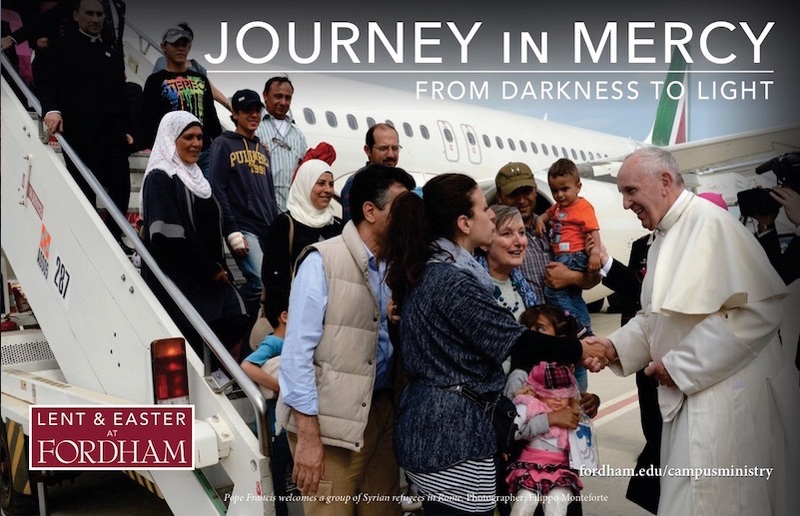 In response to the presidential administration’s travel ban on refugees from seven Muslim-majority countries, Fr. McShane sent a letter to the Fordham community in support of refugees, immigrants, and undocumented students. We at Fordham Campus Ministry stand in solidarity with this message of tolerance, especially during the sacred season of Lent. The full text of Fr. McShane’s letter is copied below and available at Fordham News. Please feel free to reach out to anyone here in Campus Ministry during this tumultuous time. As I’m sure you are aware, President Trump’s executive order on refugees and immigration has shocked and unsettled many Americans. Last night a federal judge issued a temporary stay suspending implementation of the order, but to say that the landscape is unsettled for those seeking refuge in the United States would be a vast understatement. Though we do not know the ultimate outcome of the president’s order (nor subsequent orders and legislation), please be assured that Fordham University stands with the tens of thousands of refugees and would-be immigrants affected by these laws. We have a long history as a University of and for immigrants, in a city and a nation built by immigrants. 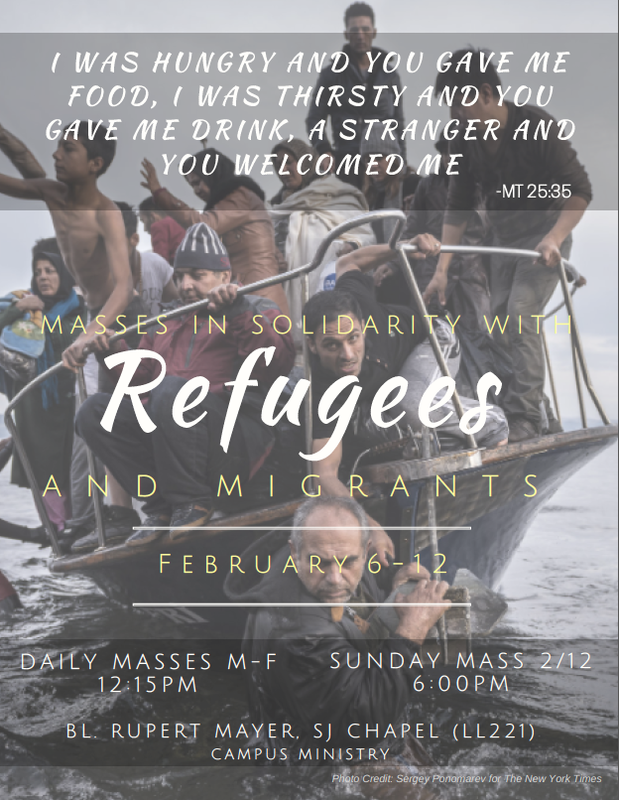 I know the Fordham Community joins me in keeping the refugees and immigrants of all nations in our thoughts and prayers today. 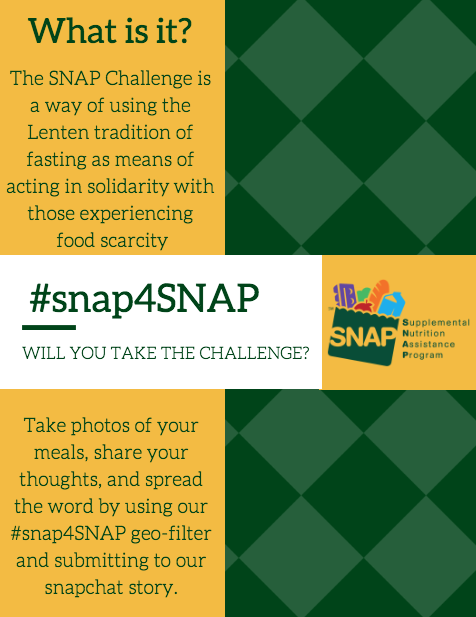 Read more from the Association of Jesuit Colleges and Universities here at the Ignatian Solidarity Network.